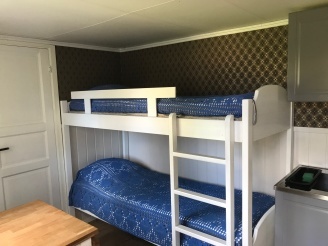 We would like to wish you a warm welcome to Enångers Bed and Breakfast. You will have received the most important information about your booking in the confirmation e-mail that we sent you. The following is general information that we hope will help you plan your stay with us! If you have any further questions please feel free to contact us on telephone + 46 650-550125 or via e-mail enangerbb@hotmail.se. We will be happy to help with any queries. You have booked our room with its own shower and toilet, located in a separate building, which we call our Circuswagon. A project we have spent a lot of time and love on. 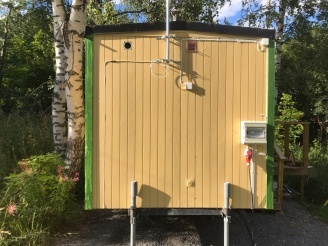 The wagon is about 40 meters from the main building, and guests have the opportunity to use the main building's fascilities, but the caravan has its own bathroom with shower, sink and toilet. Breakfast is either served at 8 am on weekdays or 8.30 am at weekends, eaten together with ourselves, or you can collect a ready made “breakfast box” from the refrigerator. If you plan to arrive later than 9 pm we would prefer to be informed about this in advance. If you arrive by car you will leave the motorway at exit 211 Enånger and then head towards Enånger. When you arrive at a four way crossing after approximately one kilometer you continue straight ahead. (Some SatNavs will tell you to take the previous exit.) Once in the town centre you will see the grocery shop “Coop Nära” on your left, and a pizzeria on your right. Turn to the right here. 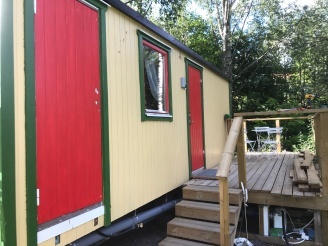 After a couple of hundred metres you will pass the creek known as Enångerån and immediately afterwards, on your right, there is a yellow house; Enångers Bed and Breakfast, directly opposite the Enångers Old Church. The local points of interest include the Enångers Old Church and the Borka Pier. If you would like further suggestions on local attractions please feel free to ask us.